Play dough is a staple in our early learning activities. Whenever I set out an activity that involves play dough I know the kids are going to dive in and be engaged for quite a while. Over the years we’ve tried many play dough invitations, and we’ve used play dough as the foundation learning many different skills. Here we’ve repurposed our snowman play dough invitation into an activity to practice learning 2D shapes. 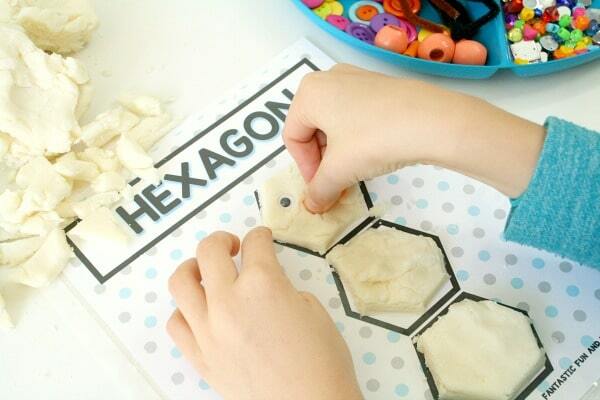 It’s perfect for preschoolers and kindergarteners who are learning shapes. For this activity we started with sparkly white play dough a loose parts from our snowman play dough invitation. 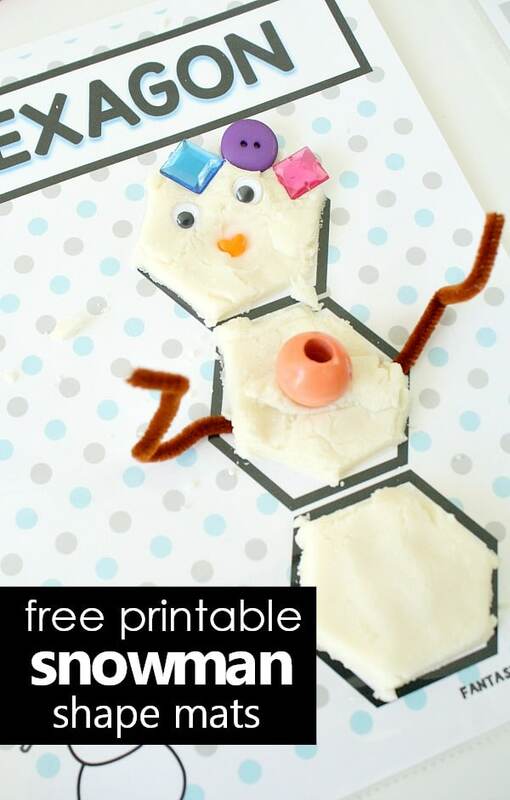 Then we printed out our free printable snowman shape mats. There are two variations. 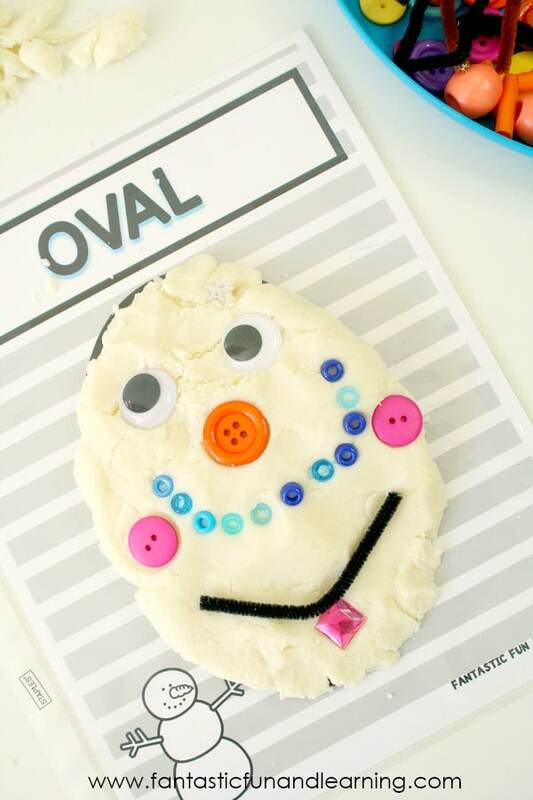 One set includes one large shape for making a snowman face. The other set includes snowman bodies made out of different shapes. Use the set that best meets your needs. Both sets also come in a low ink black and white version. You can print those ones on colored paper if you’d like to save ink and still add a little winter fun. 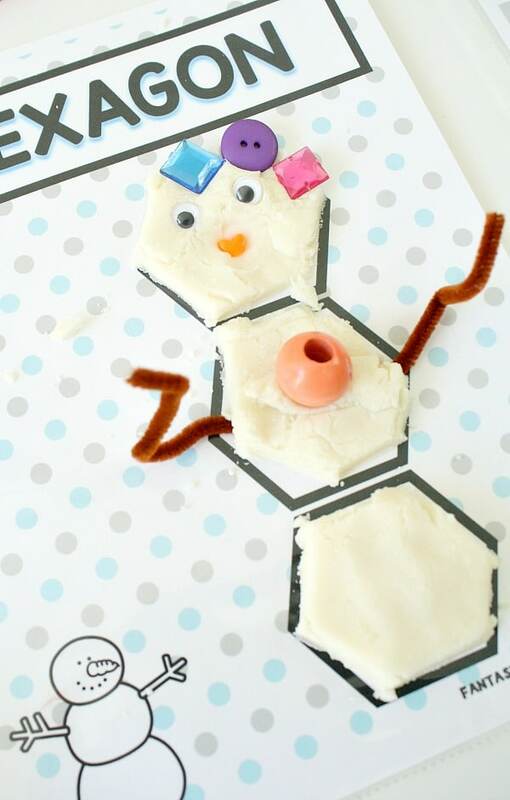 For the first set of shape mats kids are invited to build different shaped snowman faces. These larger shapes are a bit easier for toddlers and younger preschoolers to work with. 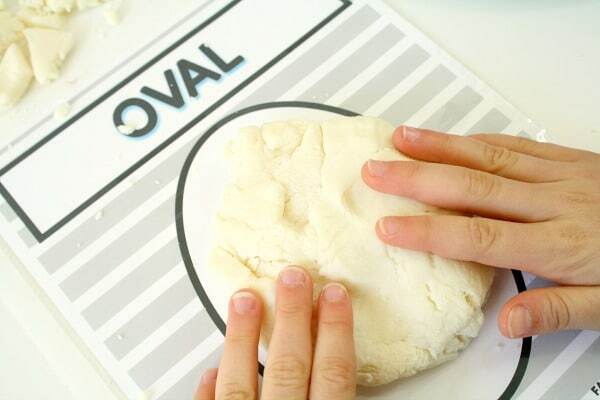 They can start by pressing out the dough to make the shape. 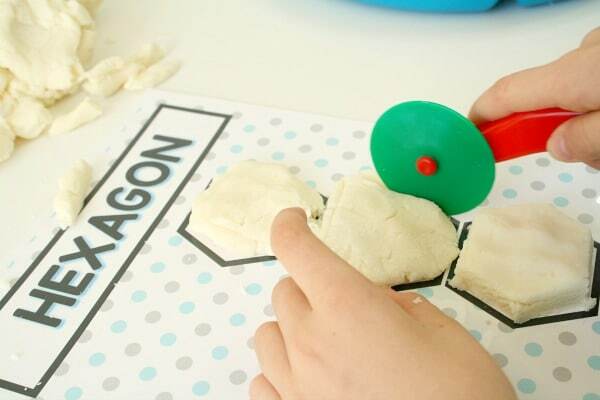 You can also offer a dough cutter if kids would like to roll out and cut the shape. Then it’s time to get creative with different facial features. 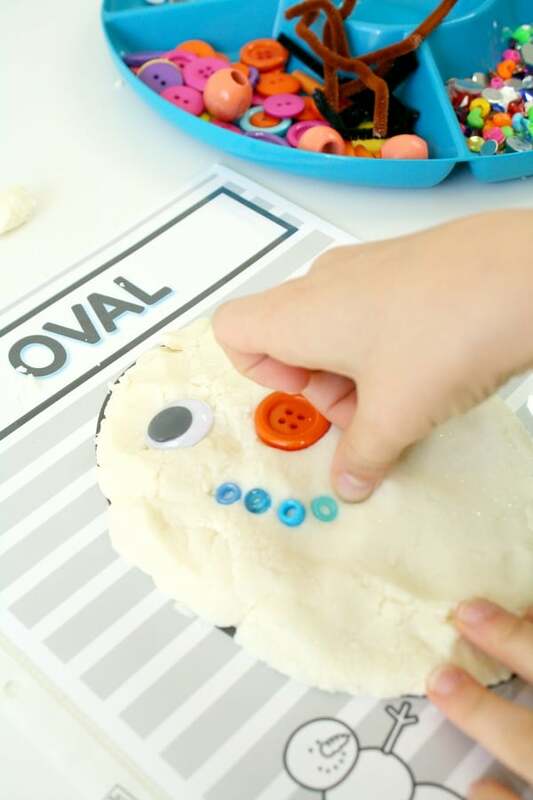 At first kids might make something similar to a common snowman they might see in a picture book. 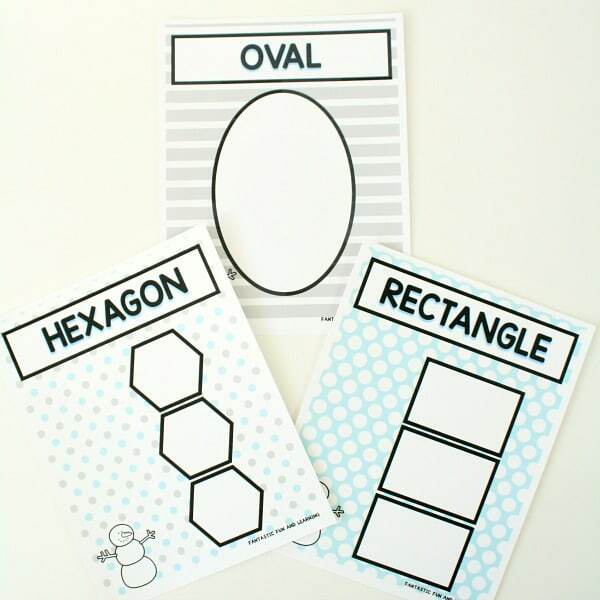 However, if we give kids a longer period of time or multiple opportunities to explore with these shape mats, they will often get more and more creative with their decorations as they make new snowmen. 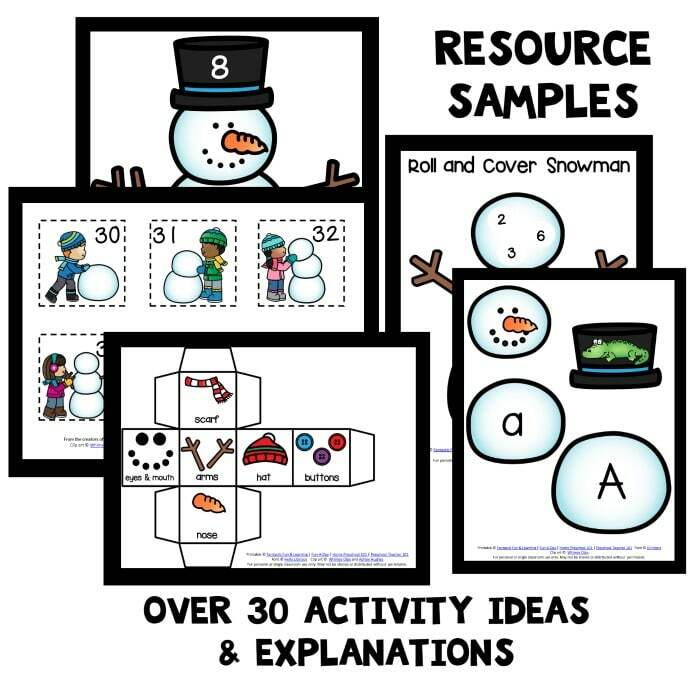 In the second version of shape mats kids get to make a whole snowman. Working with these smaller shapes can add an extra layer of difficulty, so they may be best for older preschoolers and kindergarteners. We used dough cutters to cut straight edges for the shapes that had flat sides. Then kids can finish up their snowman with a mixture of loose parts. If you’re working with a group of children, extend the activity by giving kids time to share about their creations. This is an easy way for kids to work on oral vocabulary and share their thinking. 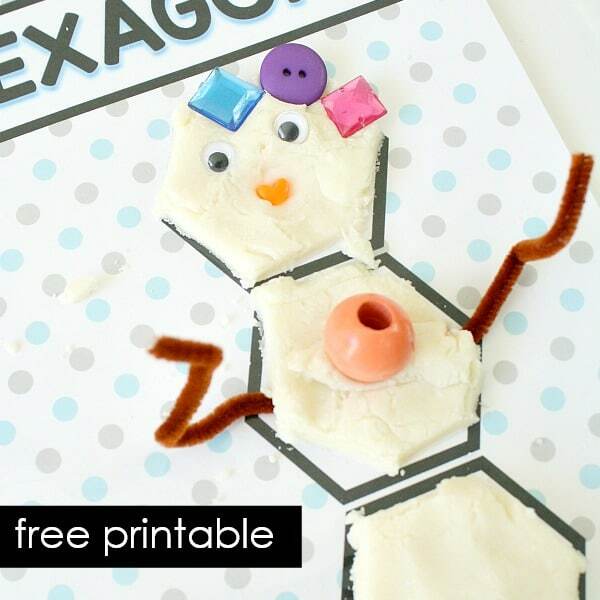 See both our snowman play dough invitation and these snowman printables in action. Use the link below to get you free snowman shape mats. The 31-page set includes both versions of shape mats for eight different shapes. Both sets are included in color and in black and white so you can use the set that works best for you.